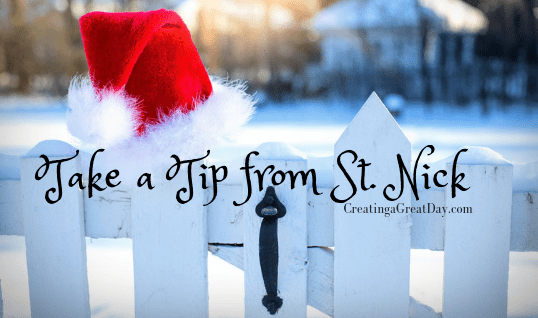 As the kid’s and I were listening to an audio book called The Autobiography of Santa, I couldn’t help but think about how we all need to take a tip from St. Nick. You see the orphan turned bishop, who eventually turned into a larger than life mythical, jolly, gift-giving legend, started out as an innocent young man simply trying to provide for others who were in need without embarrassing them. He would sneak in, gift items to children so the parents wouldn’t be ashamed. His goal was to give anonymously! He did it without fan fare and did not want to claim the recognition. It is this very act of going about giving gifts that we should take as a tip from St. Nick. 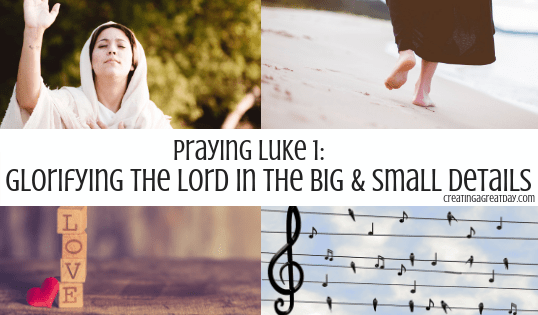 In a world where every act of kindness seems to be captured and posted on social media, it’s refreshing to take on the challenge of doing good and keeping it between us and God. His love compels us to love like he loves and to give all the glory to God instead of keeping it for ourselves. Have you ever done this? 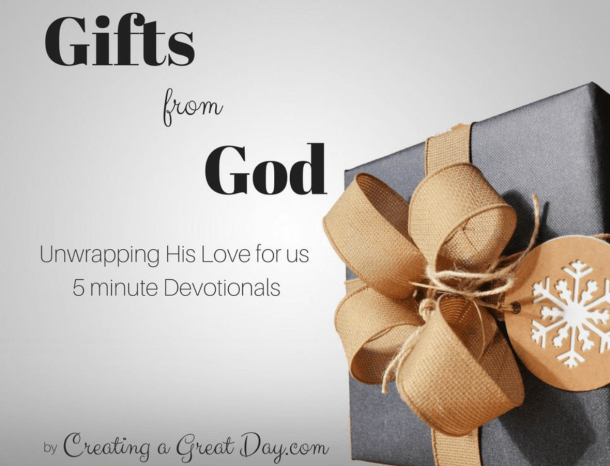 Have you ever given a gift to someone and they didn’t know? I had an amazing English teacher when I was in High School who challenged us to do good deeds and not tell anyone. I took this to heart and found that it’s like having a wonderful, uplifting experience with Jesus. It brings so much joy to give to others and since God knows all our actions, we can bask in the opportunity to share what he has shared with us with others and praise Him for letting us do it! Obviously, St. Nick holds the monopoly on using chimneys. I don’t mind that much because I’m not one for small, sootty spaces. But there are plenty of ways that gifting to those in need can happen without much fan fair. One of the most important things to do when trying to meet the needs of others is listening to them. Find out what they actually need and gift that specifically. In this historical fiction book there is a dialog that happens between the young Nicholas and his priestly mentor, who encourages him to see the needs around him and problem solve how best to give. Did you leave a note as to how to use the funds? How were they supposed to know the money was for crutches? Would the girl lean on the coins to go buy the crutches? Understanding what the priest was saying, Nicholas later returned, after carving the girl a special set of crutches. I’ve mentioned before how I have personally realized that sometimes I believe I know what someone needs better than they know their own needs. Well, I’ve been shamefully wrong before and Jesus’ example leads us to listen, provide physically, and explain how God provides spiritually. So the key to giving well is to listen and pay attention to those in need around us. If you want to get in the need seeking and gift giving mood as well as be entertained by how the adventures of Nicholas evolved into Santa Clause, then you would enjoy listening or reading The Autobiography of Santa Clause by Jeff Guinn. It’s full of historical facts, figures, and in a beautifully entertaining way weaves in geography with the rise and fall of empires. It embarks the reader upon an adventure of understanding how December 25 became the day to celebrate as well as including other men to myth legends such as King Arthur and Attila the Hun. Our family has had so much fun listening to it, especially since we’ve been studying many of the places and people that are mentioned. But of course the greatest gift giving book is the one that brings a joy-filled eternal life – The Bible. Through these pages and in every story, if we look close enough, we will see how God weaves his love throughout the generation to give us the best gift ever, his one and only son, who would choose to glorify God and sacrifice himself on the cross, so that we could be united in heaven with God eternally. Jesus came into the world quietly, without a lot of fan fair. He found the ultimate way to meet our most glaring need, which was removing our sin, which broke our relationship with God. With a willing heart, Jesus did not hold any good thing back from us. If you haven’t fully taken hold of this gift of grace that Jesus has extended to each one of us, then don’t wait any longer. Realize that his grace is for everyone and the greatest gift you could ever give to someone else is to share the story of God’s amazing grace with others. Don’t selfishly hold it all to yourself. Don’t fear the reaction of what giving the truth of God’s grace to others might be, just give it freely. It’s THE best gift you could ever give because we all need it! Nicholas understood this very well too and it was a gift he “fought” to gift as well. He willingly served time in prison when the Roman emperor Diocletian was persecuting Christians as well as at the Council of Nicaea. So take this tip from St. Nick: Give anonymously to the needy and share the Gospel Truth with others! 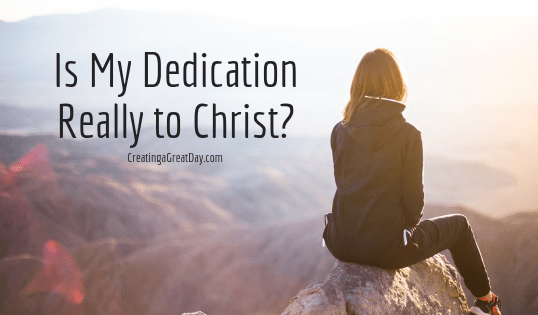 Is My Dedication Really to Christ? This question came while we were reading the Hanukkah story. Hanukkah actually means dedication and celebrates the day when the Temple in Jerusalem was once again dedicated to God after being desecrated by the Greeks. Jesus celebrated this festival of dedication. He knew what it meant to be dedicated. His dedication to redeem our relationship with God that our sin destroyed led him from Heaven to Earth. He spent 30 years preparing, so he could live with a fierce focus that would lead to a physically excruciating end on the cross. He overcame death and destroyed Satan’s hold on us, so that we could live eternally with God. God sustained Jesus so he could have that kind of dedication. We have the same choice to live with this kind of dedication. I know it seems out of our reach and if we were trying to do it by ourselves, I would completely agree that it is impossible. But with God all things are possible. With God, Jesus, and the amazing gift of the Holy Spirit, we can overcome. We are called to overcome, not by our own power, but by God’s might! Are we really willing to dedicate ourselves to Christ? If you are reading this blog, more than likely you at some point in your life decided to follow Jesus. You were overcome by knowing that even if you were the only person that had sinned, Jesus still would have gone to the cross to save you. The truth is we all have sinned and should all be overcome that Jesus dedicated himself to rescuing us from our sin. Some of us, upon receiving his gift of grace, fall completely into digging into the Bible, learning all we can so that we can follow Christ. While some of us, just talk about how we follow God, but never really understand where he is leading, so we miss following his path, all the while proclaiming that we are on it. 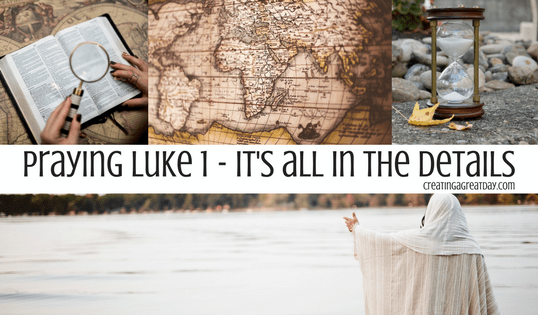 So how do we know we are following Christ? Our dedication to following Christ starts with reading his word. We pick up our Bible and read it. The fact that we have access to God’s word is a miracle in and of itself, but that’s a topic for another post. Don’t waste the miracle sitting in front of you. Take hold of the Bible. Even if it’s confusing now, just read it and pray for wisdom. God will give it to you. Then, prepare your heart. We have no idea how to dedicate our lives to God if we don’t prepare ourselves for daily dedication. This daily dedication starts by putting what we read into practice. Yep, it’s difficult. Some days more difficult than others, but it’s something we must do. If we don’t do it, then we are deceiving ourselves into thinking we are following Christ! That’s a bold statement but one James does not shy away from. He wants to make sure that if we say we are followers of Christ, then we actually follow Him. Do what it says. Anyone who listens to the word but does not do what it says is like someone who looks at his face in a mirror and, after looking at himself, goes away and immediately forgets what he looks like. Dedication to Christ is a daily choice. Later that day, my daughter had another question in regards to whether or not I would allow her to do something. 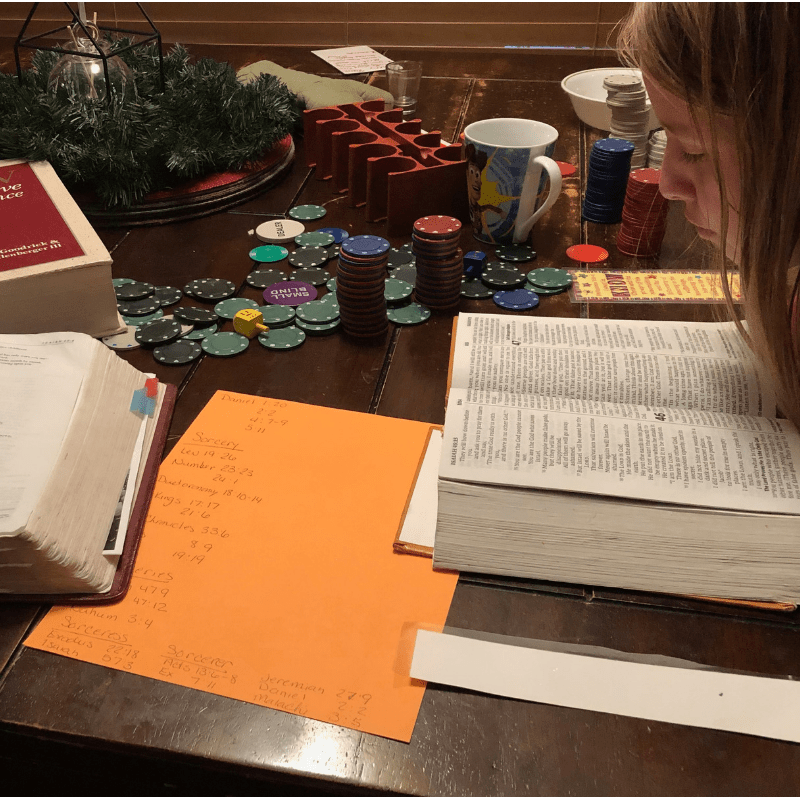 She didn’t know any verses right off that would tell her “yes” or “no,” so the next day we pulled out the Strong’s Exhaustive Concordance, our Bibles, and read through many passages to which her question pertained. There are many more she can still read to solidify what God’s will is in regards to her question. The answer she started to find in the Bible did not line up with what she wanted to do, so now she has a choice and she gets to choose. Will she continue to dedicate her life to Jesus or will she dedicate it to something else? Taking a break from playing spin the dreidel to dig into the Bible! As a parent, I pray that I will take advantage of these opportunities to continue guiding her and our other children in the right direction, helping them sort the truth from the lies, and showing them that even when we fail spiritually, Jesus’ grace is sufficient for us. Celebrate a Festival that Jesus Celebrated this Christmas Season! Never in my wildest dreams did I think our family would celebrate Hanukkah! Would you? I grew up enjoying everything Christmas and never gave Hanukkah a second thought. It was a Jewish holiday and so it didn’t fit, or so I thought! 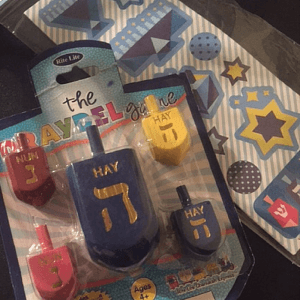 I’m actually really ashamed to admit that all I ever knew about Hanukkah was that it had to do with lighting candles, a weird top called a dreidel, and it was filled “eight crazy nights” according to Adam Sandler. Yes, sad that most of my knowledge came from this song! 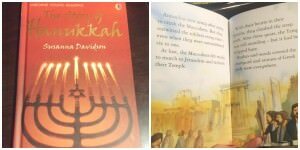 But what I found is that Hanukkah is really all about celebrating God’s miraculous ways and sharing it with each generation. Then I learned that Jesus celebrated Hanukkah. It was now winter, and Jesus was in Jerusalem at the time of Hanukkah, the Festival of Dedication. What!?! Did you know that? 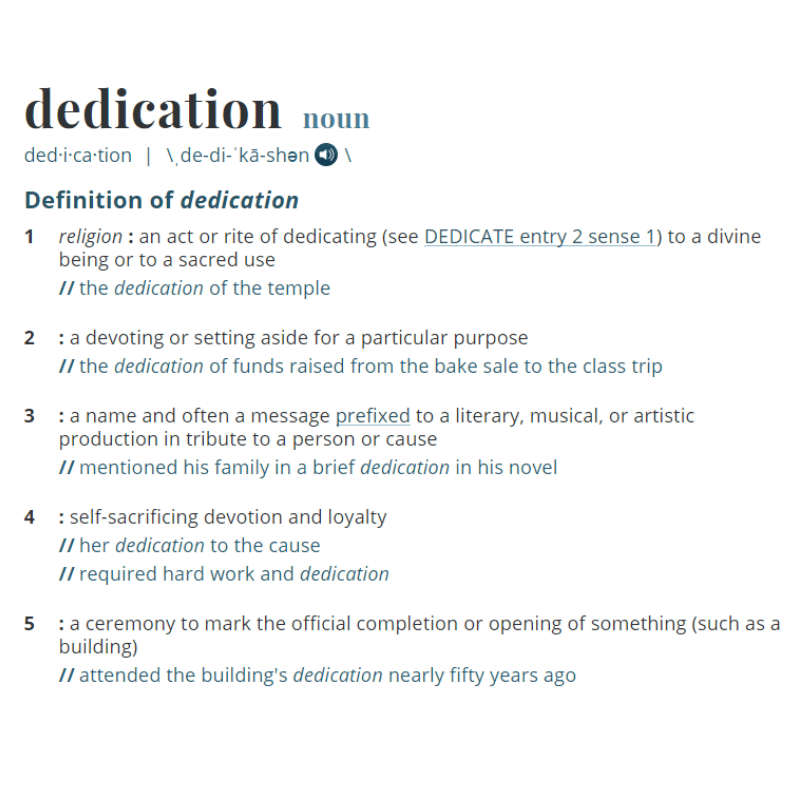 I swear I’ve read that passage a million times and never realized Jesus was ever involved in Hanukkah, not until I learned another name for it was the Feast of Dedication or the Festival of Dedication. It’s also known as the Festival of Lights, Chanukah, and Chanukiah. It’s amazing once I started to learn about Jewish history and customs how the New Testament came alive even more, but that’s another post. Once I learned these facts, my family and I couldn’t wait to celebrate Hanukkah. We love celebrating our Lord and Savior and couldn’t believe that Jesus celebrated it too! 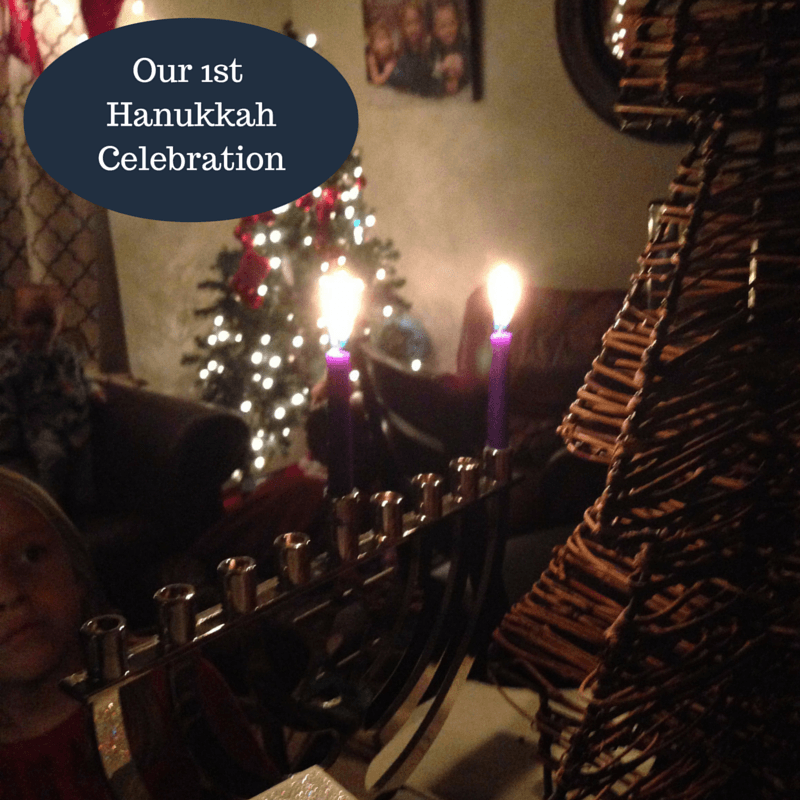 When we started celebrating Hanukkah, our children were 6, 5, 3, and just over 1. I did not know what to expect from them but wanted them to be involved so we found a short book called The Story of Hanukkah to read about the history of what led up to the re-dedication of the temple and why it is celebrated. If you don’t have time to get this book, here are some great videos to show that give a good explanation. A short 2-minute video about Hanukkah for kids. A more detailed explanation from a Messianic Jewish perspective (Jews who believe Christ is Lord). In a nutshell, the Israelites were under Greek rule. Under Antiochus III, they were allowed to worship God as they always had and lived in peace, but once he died and his son Antiochus IV took over, things changed for the worse. The Israelites were forbidden to worship their God upon penalty of death. The holy books were destroyed and the Israelites were commanded to worship the Greek gods that had been placed in the confiscated temple! Can you imagine!?! An old priest named Mattathias led the people in a revolt, which turned into a war. Even when he died, his sons–especially one in particular named Judah–carried on the fight for religious freedom and miraculously thwarted the great Greek army. Judah was nicknamed Maccabee, meaning hammer, and all those who fought with him were referred to as the Maccabees. But that wasn’t the only miracle. Once the Israelites won the battle against the Greeks, they returned and started to restore the temple. They rededicated the temple to God and lit the Menorah. As commanded by Moses, once lit it was never supposed to be allowed to go out. Normally, this wouldn’t be a problem, but it turned out they only had enough olive oil for one night and the process to make more would take at least eight days. Even though they only had enough oil for one night, God kept the Menorah lit those entire eight days and nights! So every year since then, Jews have celebrated this miracle. The Shamash Candle means The Servant Candle. The Servant Candle is the one that lights all the other candles. This is the perfect parallel to Christ. He is the light of the world and calls us to shine his light too! We get our light from him! When and How We Celebrate Hanukkah! The Hanukkah celebration starts every year on the 25th of Kislev, which is a different time every year on our calendar. In 2018, it begins on the evening of December 2nd and will end on the evening of December 10th. Isn’t that exciting! 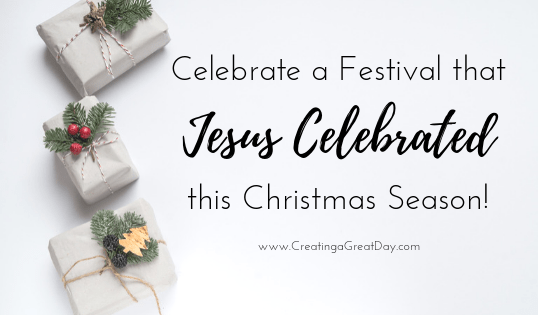 We can literally kickoff this Holiday season by celebrating a festival that Jesus, himself, celebrated! I’m ecstatic! Every night around dusk, we would bring the kids into the living room by turning on this hilarious song called Candlelight by The Maccabeats. After dancing and laughing to this song a few times, we would turn off the lights and light the servant candle. Then depending on the day we would light the corresponding number of candles, letting the kids take turns lighting the candles. (The first day, we lit one candle. The second day, we lit two, and so on.) As we lit the candles we recited the blessing then talked about how Jesus is the light of the world and we are called to be his lights too. After lighting the candles, the first couple of nights we read through the book mentioned above, then prayed and sang some songs. 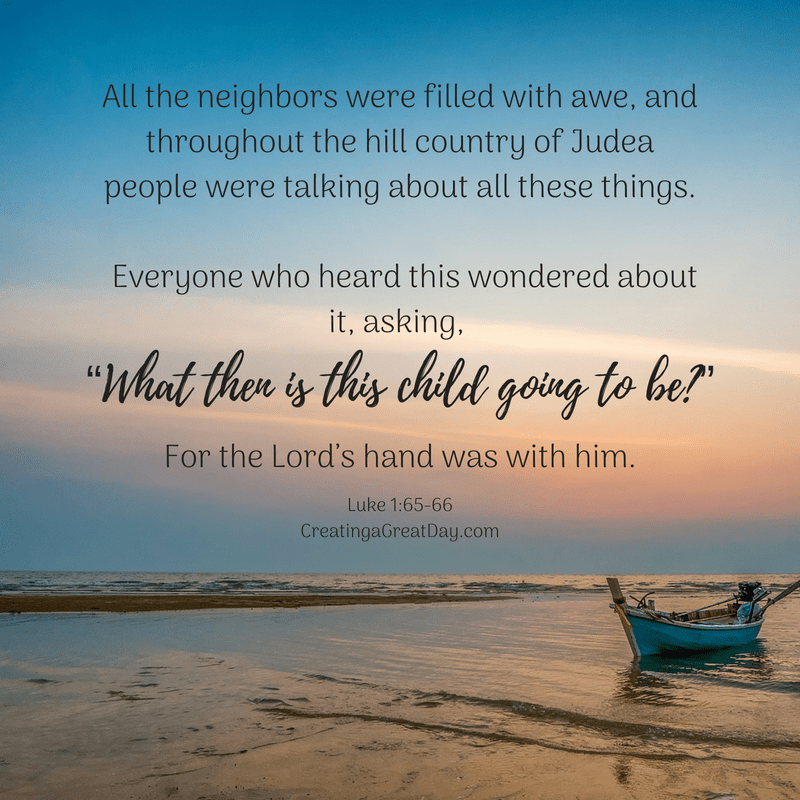 The following nights we asked the kids why we were celebrating Hanukkah and reviewed the story, then we would talk about some of our favorite miracles from the Bible and even the miracles our Lord has done in our own lives. We usually spent about an hour together focusing this way on God’s goodness, singing, and worshiping together. It was one of the most peaceful, relaxing, joyful times we have had during the Christmas season! 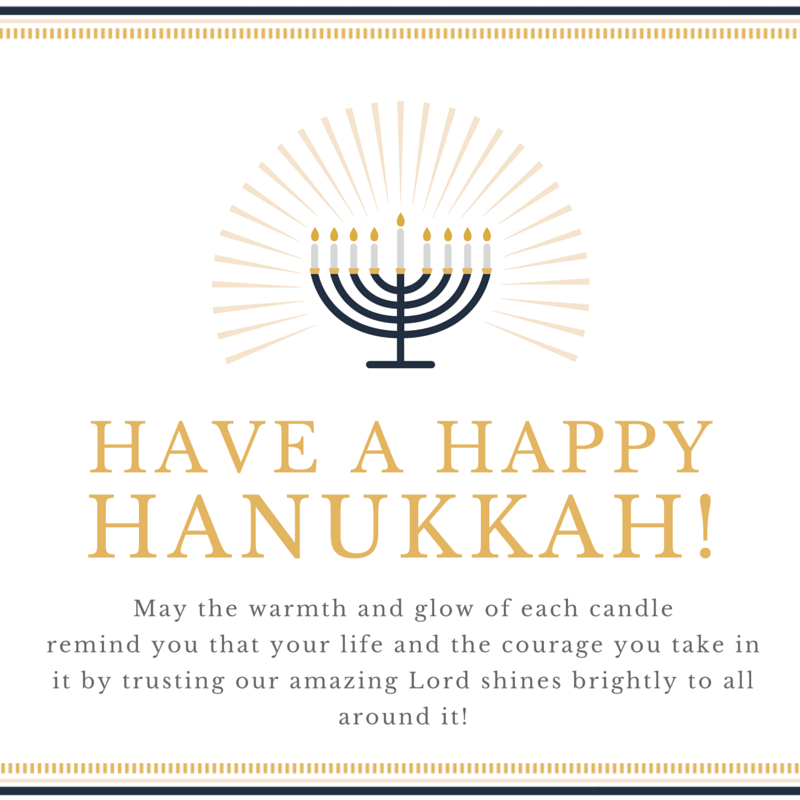 This year, when I pulled out the menorah, our children asked if they could light the candles immediately! I was thrilled! Over the years we added a few more fun things, but didn’t want to miss the focus. For dinner together, we have tried some of the fried foods, which are the typical celebratory foods. They eat a lot of foods fried in olive oil to commemorate how long the olive oil lasted. Latkes (fried hash brown pancakes) And just in case you need some inspiration in song form check out this video! During our play time, we also play spin the dreidel. We could add a lot of extras in there. 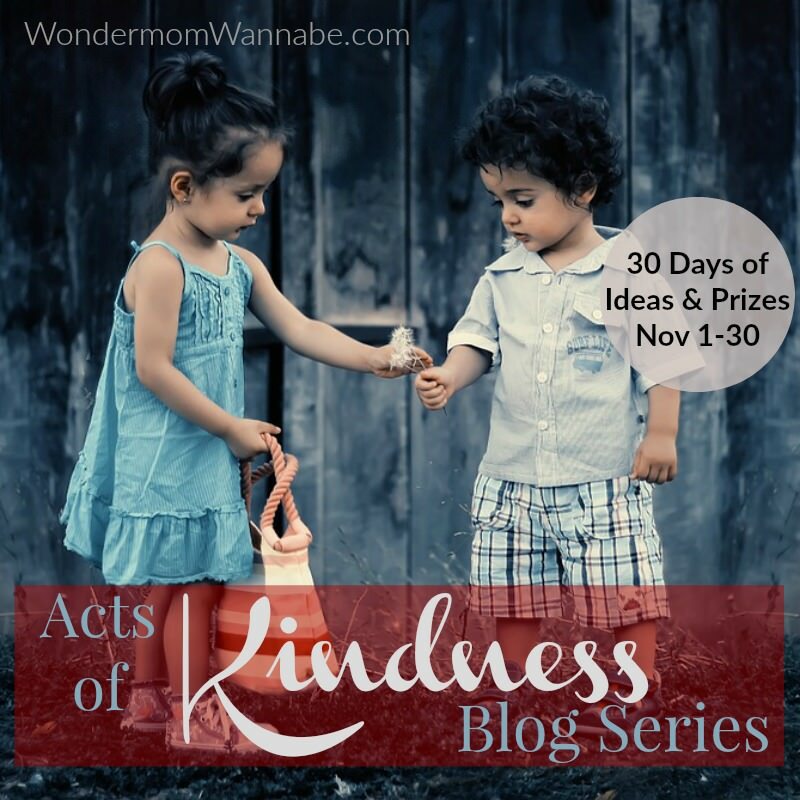 Pinterest is full of ideas, but truly, I loved how we focused on God’s miraculous ways. We didn’t get overwhelmed by adding one more thing to our already packed schedule. Like I mentioned before, it was actually the perfect resting time…by celebrating Hanukkah we were resting and basking in God’s goodness. What could be better than that during a season where we are wanting to focus all our attention on the miracle of Christ? Ever since I was little, I’ve loved exploring. 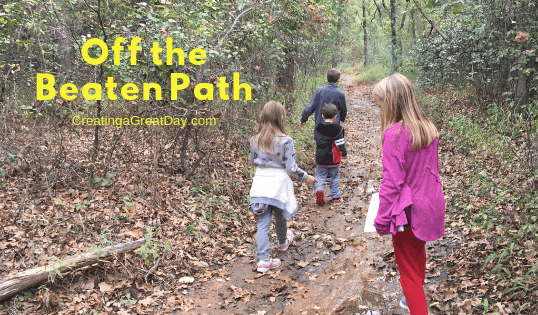 Encouraging our kids to explore is one main reason that I encourage them off the beaten path too! Sometimes, these adventures bring up reactions that I don’t expect at all, which is exactly what happened on our last adventure. We have been exploring a new area of Texas lately. Our adventures take us to new sites and sounds and many new parks. One of the parks we have enjoyed is the World Adventure Park. Not only does is the playground itself unique and have a built in scavenger hunt as well as enough swings for all our kids, but it also has a nature walk adventure. After playing on the playground for about an hour, we started our nature walk adventure. At first, we followed the path. That was easy enough to do since the initial walkway had rails on both sides. Soon enough that pre-built pathway ended and every time we came to a fork in the road, a different child had the opportunity to choose which path we would take. One group wanted to take the scariest path every time. One group wanted to take the safest path every time. It was a fun time overall UNTIL we apparently took too many paths that led out of the park. After several off the beaten path choices, we ended up following a trickling stream. The canopy of trees grew a little denser but the path was clear. The footprints were clearing ours, a few dogs, and then one large animal print that was the size of my head. I chose not to point that one out to the kids because at this point one was starting to panic. We were too far off the beaten path for him. He just wanted to go back home and did not want to continue. A large hawk flew overhead. The trees rustled. His little hand stayed tucked in mine. I encouraged him as best I could that we would find the main path again soon and he did not have to worry. When big tears started to encroach the rims of his eyes, I realized his fears were overcoming him and we needed to stop and pray. 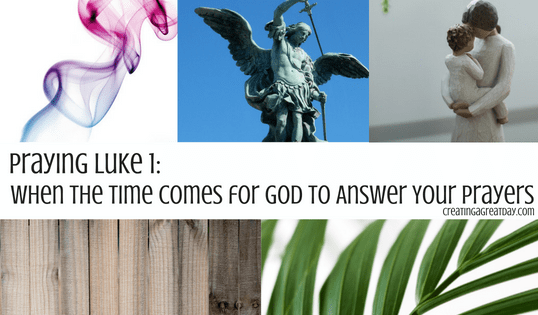 In my short exploring life, I have had some instances where panic started to set in and the only thing that keeps it at bay is inviting God in to overtake the situation. So that is what we did. We stopped, circled up, and prayed. We prayed for calm hearts, the opportunity to see God’s beauty in what was around us, and to find the main path soon. I have a forge on mentality. If something goes wrong, just keep going. In this case, I assumed that turning off the path that followed the stream and turning onto another path that seemed to go northward would get us back to the main park. Well, we did eventually find an open clearing but it led to a baseball field, which according to my calculations was a little ways away from the park area where we parked. So we turned around, retraced our steps, enjoyed a daytime owl serenading us until we found the main path again. Needless to say, my son’s heart was comforted in standing on the main path again. “Going off the beaten path” spiritually isn’t necessarily a horrible thing. Sometimes as a church body we get caught up in things that really don’t matter eternally or we allow a few to steer our spiritual connection with God instead of connecting to Him personally. 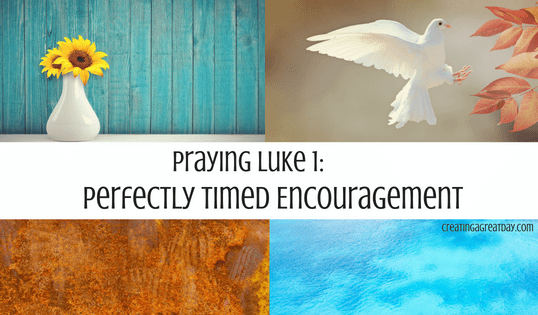 In these instances, it is most definitely needed to go off the beaten path and encounter God ourselves and to listen to where the Holy Spirit is leading. It reminds me of the story of the William Booth, the man who started the Salvation Army. William Booth’s church leaders decided that the best course of action for his life was to preach to the church body and rejected his idea of going to the slums in the East End of London. Instead of sticking with his leaders’ pre-approved notion of what God wanted for his life, he turned to the guidance of the the Holy Spirit and taught in the streets to the poor, homeless, and destitute. He left what was comfortable and choose to venture off the beaten path to a place where no one else from the christian community wanted to go. It was a path that looked scary and dark to most, but he wanted to bring light to the path. His converts to Christ were prostitutes, thieves, drunkards, and those who would never step foot in a traditional church setting. Reaching out to those in this environment was not easy, it required much prayer and trust in the Lord. We might not have understood the history behind the Salvation Army, but that one man’s choice has impacted thousands of lives. Many of us probably think of the Salvation Army simply as bell ringers during the Christmas holiday. We may either throw in a few coins or try to avoid them, but I want to challenge you now. Every time you hear that bell ring this holiday season, pray and ask God if he is calling you off the beaten path. Is God asking you to step away from the comforts of the Christianity that you know? Is he calling you off the beaten path to reach out to those who would never enter the comfortable christian setting that we know? Are you willing to go off the beaten path and follow Christ wherever He may lead? Oh, Lord, help us not get so comfortable that we shirk your calling to reach out to those who don’t know you yet. 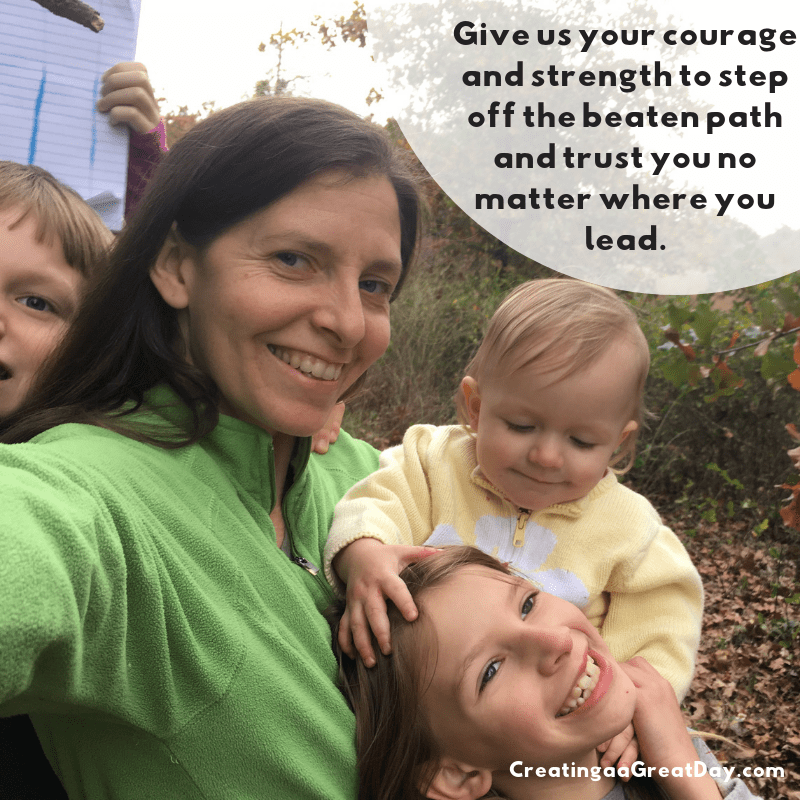 Give us your courage and strength to step off the beaten path and trust you no matter where you lead. In the One who left the comforts of Heaven, took the pain of our sin upon him, so that we could have a path back to Heaven – Amen! The importance of a name. The Name we proclaim will determines the direction of our lives. 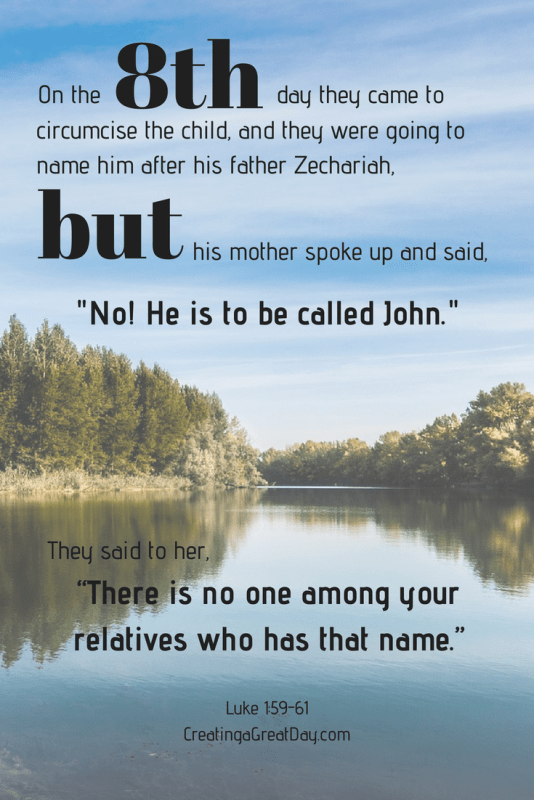 Zechariah was given a chance to show his faith or lack of it, by simply proclaiming a name. We are given this same option. The power of believing God even in the smallest of details means that we are showing others our utter and complete belief. In this case, the “small” detail boiled down to a name. 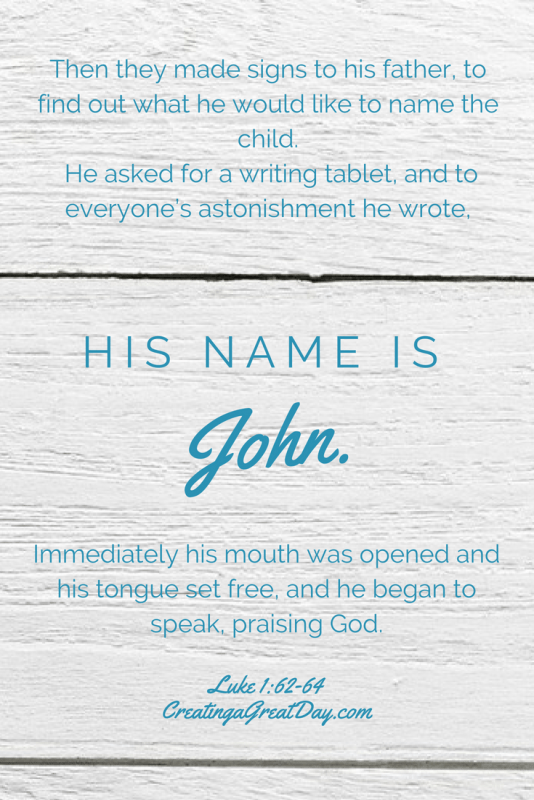 The name of a child who would then proclaim the name of the Lord Almighty! The is the name under which every knee shall bow and every tongue will confess that Jesus Christ is Lord, to the glory of God the Father. Now, the most important name you will ever say is Jesus Christ is Lord. 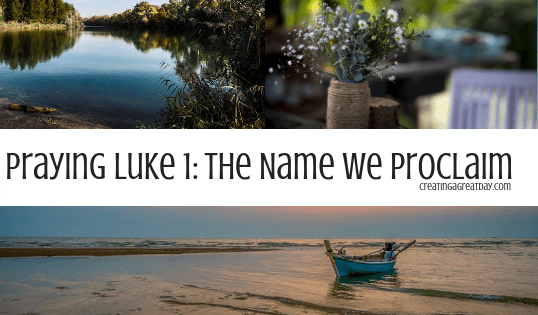 You will either proclaim it with joy in His heavenly presence because you proclaimed it here on Earth or you will proclaim it out of fear, knowing that you did not carry his name as the biggest and smallest detail in your life. May we never have to dread this day. May we willing wear his name and share proudly with others that we are followers of Christ and they should be too! As Zechariah wrote out his son’s on his tablet, in the silent but loudest voice he had, he proclaimed his faith in the Lord, the Name above all names! When we read this, Lord, we want to jump up and down for your mercy and what you did for Elizabeth too! Oh , the mercy you had on Elizabeth! In her old age, after her decades of wanting a child and never being able to conceive, you miraculously opened her womb and gave her a son. And not just any son, but one that would announce the coming Messiah! What mercy and love you poured out over her!! What a blessing to be able to celebrate this gift with her friends and relatives! Let us be a people that rejoice along with our brothers and sisters who are receiving the gift of your mercy right now too! Maybe it’s rejoicing in a marriage that is stronger in you now after the devil tried to rip it to shreds. Maybe it’s rejoicing in someone coming to know your forgiveness and the gift of grace. Maybe it’s one coming seeking forgiveness and receiving your mercy as she has confessed. Maybe it’s rejoicing alongside someone whose decades long prayer has been answered. Let us be a people who are faithful, loving, and rejoice along with those who are rejoicing in all you have done for them! In the One who is faithful to all he created – Amen! Lord, when you call us to stand strong and courageous, we often think of doing this against those who are opposed to you. We don’t often think about standing strong and courageous when dealing with those who love you too. 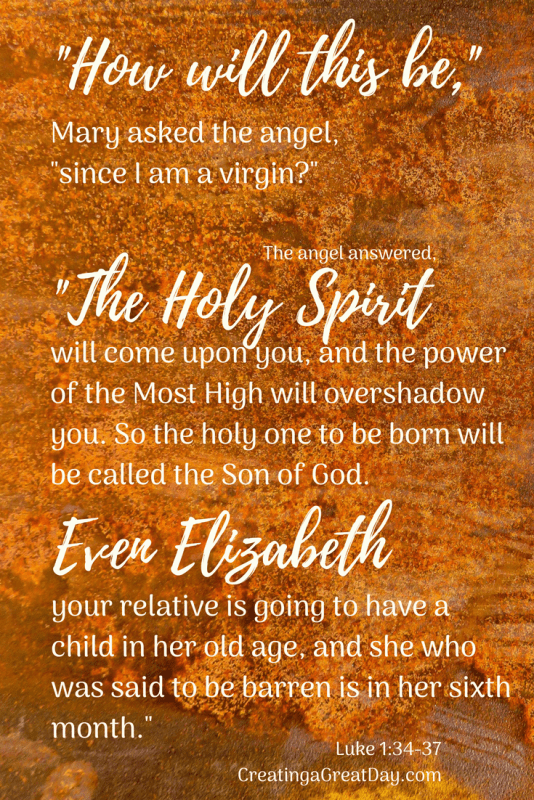 But this is exactly what you called Elizabeth to do at the very moment when the miracle baby you had given her was about to be named. 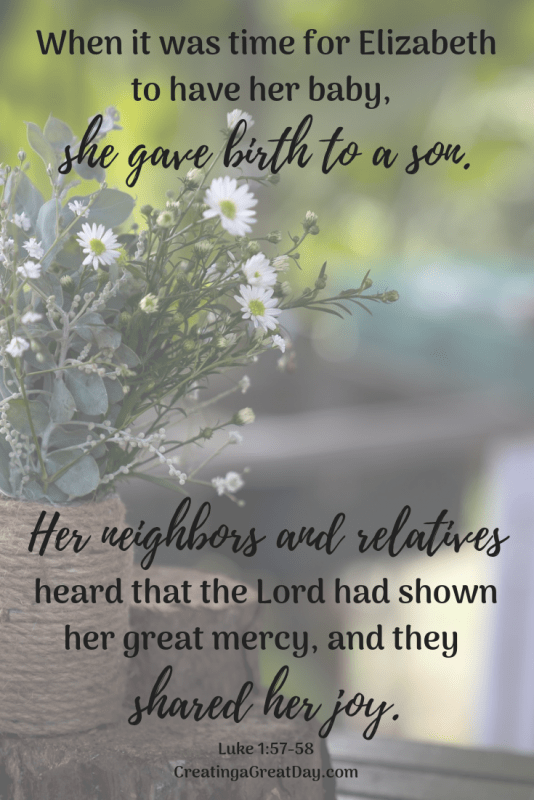 She stood up and with the voice you gave her proclaimed the name that you had determined this precious baby to be called. They would not name him after his father even though that was the tradition. It didn’t matter that they did not understand the why behind it. She was standing tall and courageous up to the family that loved her but didn’t fully understand the prophesy and miracle that you had given to her husband. Lord, we pray that we will be as bold, firm, and lovely with the ones that love us. May we not be swayed by their well-intentioned actions but hold on to the truth you have called us to live. In the One who calls us to stand for truth no matter what anyone else thinks – Amen! Lord, prepare our hearts to be challenged and questioned by others who don’t understand what you have called us to do. Help us to stand strong. We praise you for Elizabeth and Zechariah’s faith in what you told them to call their son. They could have just flippantly dismissed what you said to do because it didn’t fit their traditions. You don’t call us to be a people of tradition but a people of faith. Obedience brings about blessings sometimes immediately and sometimes eternally. We praise you for giving him his speech back again so that he could go on to tell his son about your amazing ways. Let us not hold our tongues when they work so well. Let them sing your praises and glorify you through our faith! In the One who gives us a reason to sing your praises – Amen! When we humble ourselves to you and obey what you are calling us to do, Lord, you not only keep us in awe but you also keep those around us in awe too! How awesome it was for everyone in the hill country of Judea to be wondering what plans God had in store for John! He would be the one pointing the way to the Messiah! They had know clue how important his role would be, but they understood that God was doing something big. Lord, we know you are doing amazing things right now in our lives too. And just like John, you want us to point all those around us to the One, the only One, who can change their lives for the better. May we not shrink back from the responsibility you have given us or pass it off to someone else. May we pray over those whom you have placed in our lives and share the good news with them too! In the One who put us in this time and place for a reason – Amen!